Our doctors take the time to explain procedures and answer your questions. 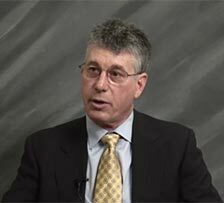 Dr. Weingarden is a Board Certified periodontist, with over three decades of experience in periodontics and in placing dental implants. He has been a leader in the field, often being the first to bring the newest and most state-of-the-art techniques to Pittsburgh. He is well known by colleagues both nationally and internationally. Periodontists are dentists who have received advanced training in diagnosing, treating and preventing gum disease, and have an in-depth understanding of how to treat the teeth and jawbone in relation to gum disease. With our training, experience and state-of-the-art technology, we can treat cases of moderate to severe gum disease without surgery over 90% of the time. We begin your treatment with a thorough review of your medical and dental history. Medical conditions such as heart disease, diabetes and autoimmune disorders can influence the manner in which we approach your treatment, as can certain medications. 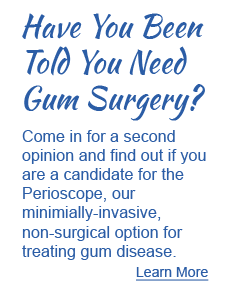 Our doctors will explain what they find and answer all your questions about your gum health. 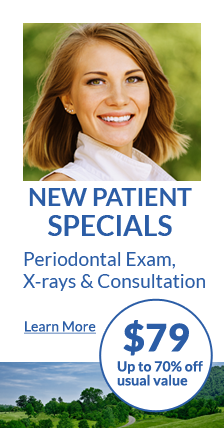 Your periodontal examination will include screening for oral cancer, an evaluation of your bite and smile, and a check for the presence of gum disease. To determine the level of gum disease present, we use a small instrument called a periodontal probe that is placed gently between your teeth and gums to check the depth of the “pockets” (spaces) between your teeth and gums. Pocket depth of 1-3 mm is usually considered to be healthy. Depths of 4-5 mm indicate mild periodontitis (gum disease caused by bacteria); depths of 5-6 mm suggest moderate periodontitis; and pocket depths of 7 mm or more may indicate severe periodontitis. In addition to taking measurements of pocket depth, X-rays may be taken to check the jawbone supporting the teeth, as more severe cases of periodontal disease may lead to bone loss. Who else should be evaluated for gum disease? Gum disease is a silent disease; it often has no symptoms. Plaque is a sticky colorless film consisting of bacteria that continually forms on our teeth, and if not removed by brushing and flossing, can form a hard buildup of tartar. It is the main cause of cavities and periodontal disease. Gums that are healthy are firm, pink and do not bleed easily. 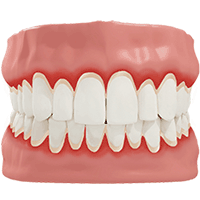 The gums are not receding and teeth are held firmly in place with no bone loss. As the mildest form of gum disease, gingivitis causes the gums to become red, swollen and bleed easily. There is usually little or no discomfort at this stage. Gingivitis is caused by the accumulation of plaque bacteria on the teeth. Gingivitis is easily reversible with professional treatment and good oral home care. If gingivitis is left untreated, it can advance to the early stage of periodontitis. In this early stage, periodontal disease begins to destroy the bone and tissue that supports the teeth. In the moderate to severe stage, periodontal disease can lead to more bone and tissue destruction. The most advanced form of this disease includes extensive bone loss. Teeth often become loose and may have to be removed. Even in this stage, patients rarely feel discomfort. Our friendly hygienists demonstrate proper brushing techniques. Our goal goes beyond simply fixing your teeth and/or gums; we want to help you achieve a state of optimum overall health We coach each patient individually, offering friendly advice and demonstrating methods to achieve oral health. We treat you as an adult, and provide you with honest information about your personal state of health and well-being, so that you can understand the underlying reasons why (if) you are ill, including genetic predisposition and unhealthy habits, such as smoking. When you begin treatment, we will encourage you to regulate practices that are contributing to poor oral health. We use our Patient Progress System to track your oral health. 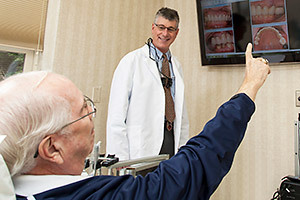 Dr. Weingarden designed a computer software program that automates the gathering of your oral health information and keeps track of your progress over the course of treatment and preventative maintenance, including information about the depth of the pockets between your gums. This system was developed to allow us to far more accurately and efficiently prevent patients from having recurrence of disease. By gathering hundreds of pieces of data we are alerted by any changes in the health of your gums at a very early stage. This preventive action can help our patients avoid the recurrence of disease and the need for retreatment. This is the key to who we are – we want you to get healthy and to stay healthy! For most patients, visits twice a year are sufficient for maintaining oral health, although patients with more fragile conditions are seen more frequently. By using the sophisticated method of perioscopy, we can treat 90% of our patients who have moderate to severe gum disease without surgery. The Periscope transmits highly magnified images to a monitor, allowing us to see precisely where hardened tartar is present. These images guide us in the process of removing bacterial contaminations that were previously only visible with oral surgery. The key to periodontal health is the elimination of bacteria, both the soft, sticky kind on the teeth and the hardened deposits under the gums. These hardened deposits are swarming with millions of live bacteria. Since magnification is 40-48x with the Perioscope, we can remove far more than we can surgically. For patients that have severe disease, we sometimes use a simple saliva DNA and anaerobic culture test to determine the specific type and quantity of bacteria in your mouth. This technology allows us to precisely diagnose the type of bacteria that is present, and to prescribe the appropriate antibiotic. We do antibiotic sensitivity testing to determine if you harbor germs resistant to antibiotics. 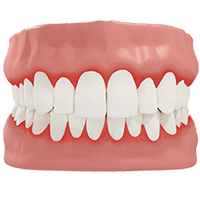 Although we can treat the vast majority of cases of gum disease effectively with the non-surgical Perioscope, there are cases when traditional surgery is required. When a patient has lost bone from periodontitis or missing teeth, we may need to do a procedure known as “flap” surgery to access the area requiring treatment. A small portion of the gum is lifted back to provide access to the underlying tissue and bone. 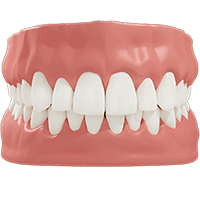 We employ a variety of techniques to rebuild bone and provide structural support for your teeth. Learn more about our techniques for rebuilding bone.